Ah, the MRT. We complain about it all the time. It’s too hot, it’s too cold, it’s too crowded, it keeps breaking down. Our daily commute often involves being packed into train carriages like our favourite Ayam Brand sardines. It’s a necessary part of getting around in Singapore, but sometimes it makes us “under happy”. Seeing as the MRT plays such a big role in our lives, there has to be a way to make our journeys less likely to make us cry tears of frustration. We asked around and found 10 MRT hacks every kiasu commuter should know to make travelling easier. Did you know that all doors on the MRT are numbered? 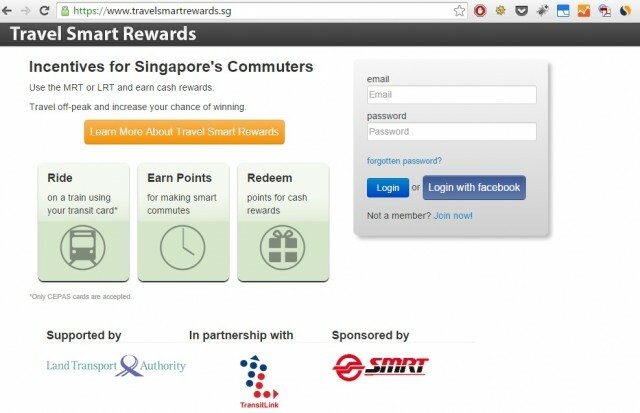 This makes it easier for your friends to hop on the train and join you on your journey. Let’s say you’re supposed to meet your friend at City Hall, and she’s joining you on the train at Somerset. Rather than leave your cosy corner to look for her, simply tell her that you’re at Door 20, and she can meet you at your cabin. 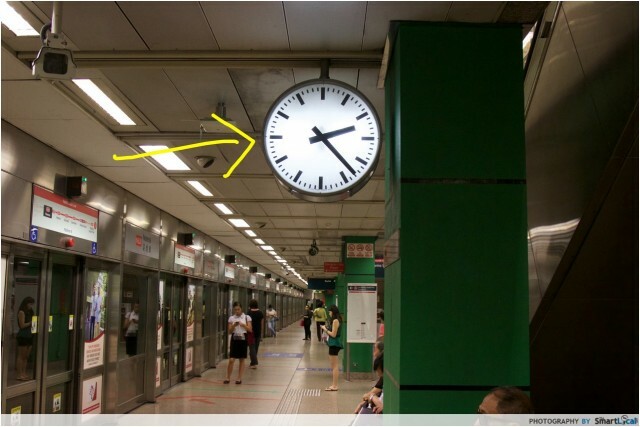 There's a white analog clock located at roughly the same part of the platform across all stations on the North-South and East-West Lines, which serves as a handy meeting spot. It’s also a great place to wait for your BFF when she’s running late again, as you’ll be standing under a giant reminder of her tardiness. Maybe that might guilt her into being punctual for a change. Sometimes, I exit from the train and come face-to-face with a daunting flight of stairs, and I weep on the inside. Knowing where the escalators are at the station allows you to position yourself at the right door- so that you can make a mad dash for the escalators and leave the crowd in your dust. 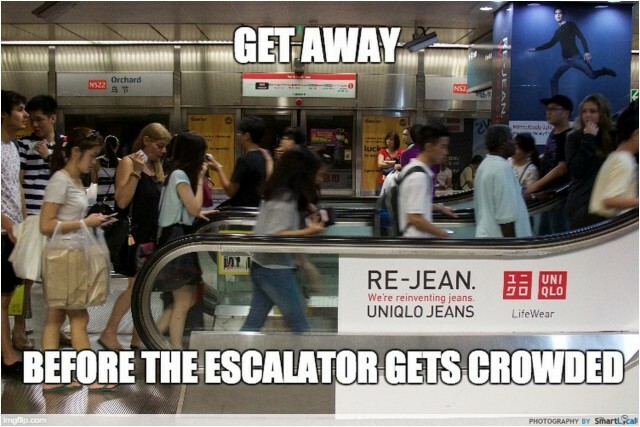 If you frequently switch lines at City Hall or Raffles Place, you will know the drama of flinging yourself across the platform to change trains. But did you know that some doors open up in front of a wall? Avoid them if you need to do a Roadrunner upon alighting. 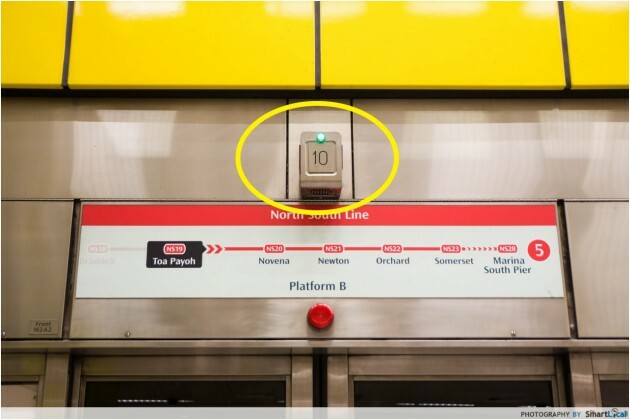 Note: For example, door 10 on the train from Joo Koon to Pasir Ris at Raffles Place Station allows you unobstructed access to chiong across the platform to get on the North-South line. Dashing out of Door 11 will result in a collision between face and wall. Certain stations open on a different side from the others after a stretch, and if you’re alighting at those stations, moving to the other side allows you to flee easily. Move to the centre of the train cabin, where all the seats are. This increases the likelihood of you being able to get a seat as you’ll be in prime position to strike once someone leaves. It’s hard to do a mad dash from the doors to a freshly-vacated seat. Just remember look around to make sure there isn’t anyone who needs the seat more than you, or you might end up on the Internet. Bonus hack: Take note of school uniforms and school-related tees, as well as which stations have a mass exodus of students. Such stations include Dover, Ang Mo Kio and Bishan. This usually results in several vacated seats, so move in for the kill. Trust us, we've done the math. This has caused headaches, despair, and broken friendships. If we’re headed to Jurong East (JE) from the North-South Line (NSL), should we stay on the line and go all the way up, or should we change to the East-West Line (EWL) at Raffles Place or City Hall? We have the solution - Bishan is where things turn around. Of course, these are for the die-hard MRT traditionalists who rue the existence of the new train lines. If you’re heading to JE from Bishan, take the Circle Line to Buona Vista and change to the EWL. It only takes 34min. Note: Waiting time for trains is not included. If your phone is low on juice and you think you’ll have a crisis if it dies, fear not. 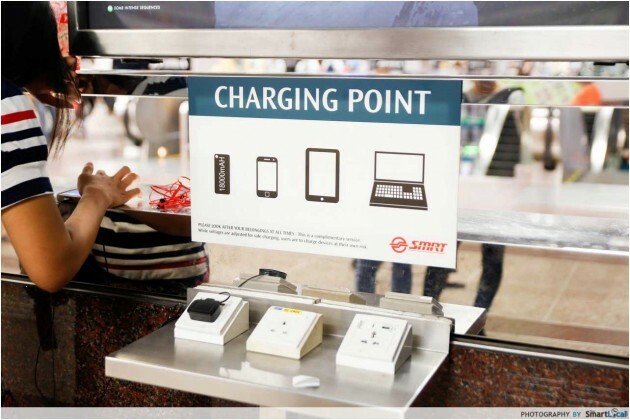 As of February 2015, five stations have charging points available for that desperately-needed power socket: City Hall, Orchard, Tanjong Pagar, Kent Ridge, and Ang Mo Kio. This is a classic hack. If you’re close to the end of an MRT line and you want a seat badly, bounce. Bouncing is something I do a lot - I’ll be at City Hall heading up to Ang Mo Kio, so I’ll take the train down to Marina Bay, wait for everyone else to get out, and plop my bottom into a seat. The train will reverse directions at the end of the line, and I can get to my destination in comfort. We mentioned in #7 that you should keep an eye out for schoolkids in uniform on the train, and move in to seize a seat when they spill out from the train to go for classes. 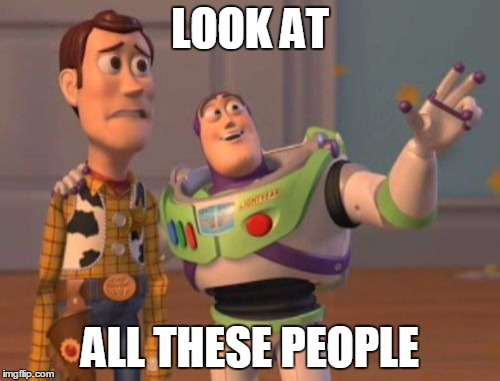 The same applies to the office crowd. If you’re travelling on the North-South or East-West line, keep an eye out for people clad in office wear. 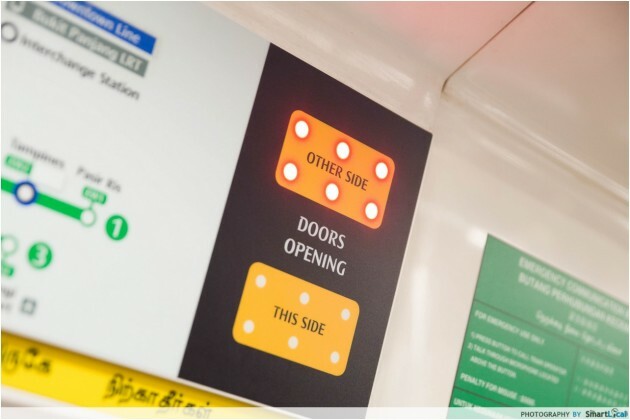 They’ll likely alight at the Tanjong Pagar/ Raffles Place stretch of the line, which opens up space for you to breathe and maybe snag a seat to rest your tired legs. One of the best feelings in the world is alighting from the train and coming face-to-face with the escalator going in the direction you want. Believe it or not, there’s a nifty app on the market that will tell you everything. Want to know which doors are nearest the lift? Or which door to come out from in order to make the smoothest transfer from the North-South Line to the Circle Line? Singapore MRT Lah is here to save the day. Just key in your start and end points, and it’ll tell you everything you need to know for a smoother journey. The app is sadly only available on Android at the moment, but we’ve got our fingers crossed that an iOS version might come our way soon. If you’re staying in the Far West of Singapore (essentially anywhere beyond Dover), you’d be no stranger to the pain of taking forever to get to Orchard Road. With the opening of the new Downtown Line 2, your journey just got so much easier. Head to Buona Vista and get on the Circle Line to Botanic Gardens, and switch over to the Downtown Line to Newton. From Newton, get on the North-South Line and boom, you’ll be in town. You have to change lines several times, but it shortens your journey by up to 20min. You know what that means - 20 more minutes to sleep. The odds are, you have a NETS card. 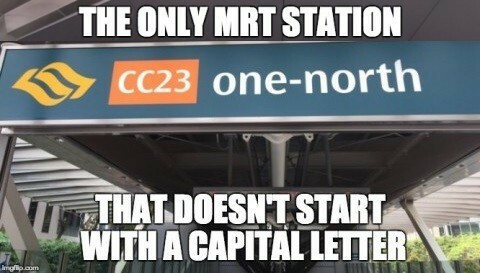 You also probably have a separate MRT card. And it’s unlikely your wallet has enough slots to accommodate the multitude of cards that are part and parcel of life. 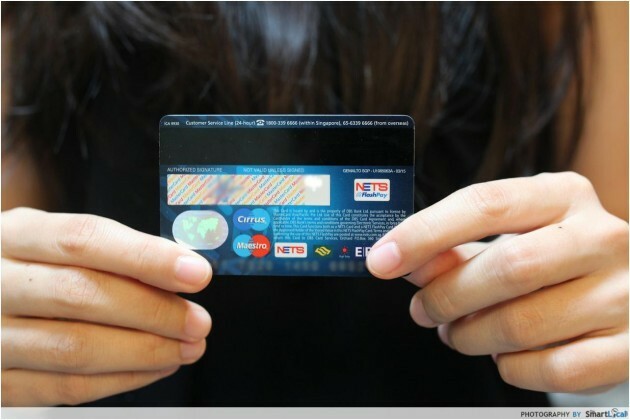 If your card has a FlashPay logo like that, top up your NETS FlashPay at any ATM, NETS self-service top-up machine or Add Value Machine Plus (AVM+). 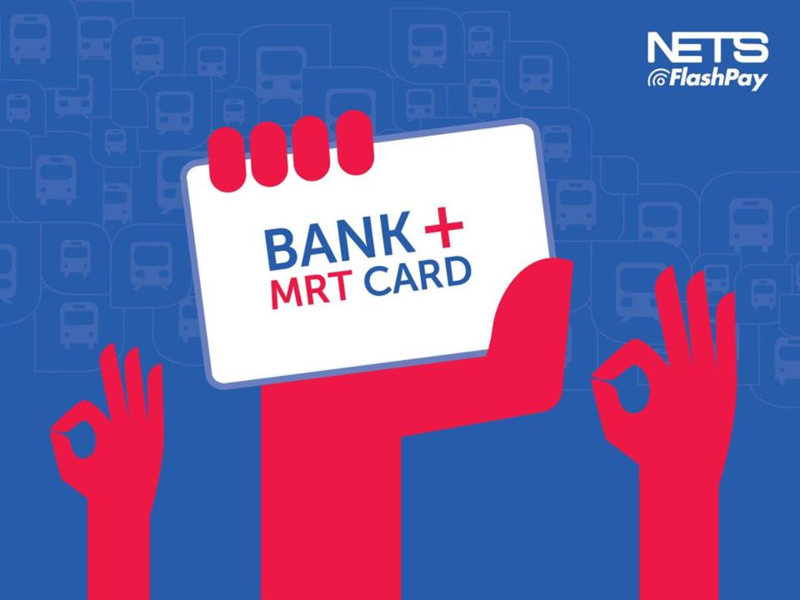 Then use it as you would use a regular MRT card, and you can redeem 10% travel rebates and earn free MRT rides! You’re essentially getting a reward for simply doing what you do everyday, which is one of the best things ever. Find out more about this nifty scheme here. These are 14 MRT hacks to make your journey smoother, but remember, common sense and courtesy are king. Armed with kindness, sensibility, and your complicated affections for public transport in Singapore, any journey can be, if not great, then at least tolerable. If you liked this article, you're going to love our article on MRT secrets. Yes, there is actually an MRT station with 164,800 one-cent coins. Check out 20 MRT secrets you need to know. This article was brought to you by NETS FlashPay.